Performance: Results as expected. Revenue & net profit rose 2.3% y-o-y and 68% y-o-y to RM40mil and RM4.4mil respectively. Net margins rose significantly to 11% from 6.7% in 1QFY06/2009. 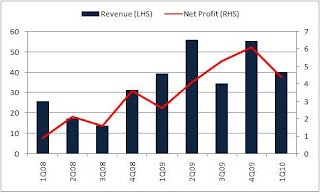 Nonetheless, on q-o-q basis, revenue dropped 27.5%, dragging net profit down by 28%. But this will be a non-issue as the lower revenue might be due to the shorter working period during the quarter owing to Hari Raya festive season. More cash: Cash pile rose to a ballooning RM112.6 million from RM88.8 million (nice number 888) which translates into 69.3 sen, which is a huge 55.5% of the share price. Borrowings remain at zero. Taking off the cash part, its construction business will be valued at a mere PER of 3.8x!!! Where to find this kind of value??!! Some more construction net margins at double digits. Share dividend!! : The company just declared share dividends in the ratio of 1 treasury share for 25 ordinary shares with EX date on 5th Nov 2009. This will further increase liquidity of its shares and boost the value of shareholders by approximately 5 sen per share (Assuming current price of RM1.26). A good move to shore up the share price. Worth accumulating now.